The chancel and nave are C13 with a C15 tower and a south aisle of c1530. A brass of 1433 is one of the finest in the country. 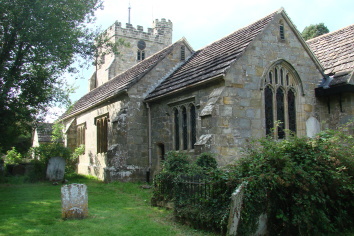 Cowfold church is separated from a busy crossroads by houses along the northern and eastern edges of the churchyard. They face inwards, creating an effect rather like a close, though there was never anything but a parish church here. The first reference is to a chaplain in 1232 (VCH 6(3) p171), when it was probably a chapelry of Henfield. 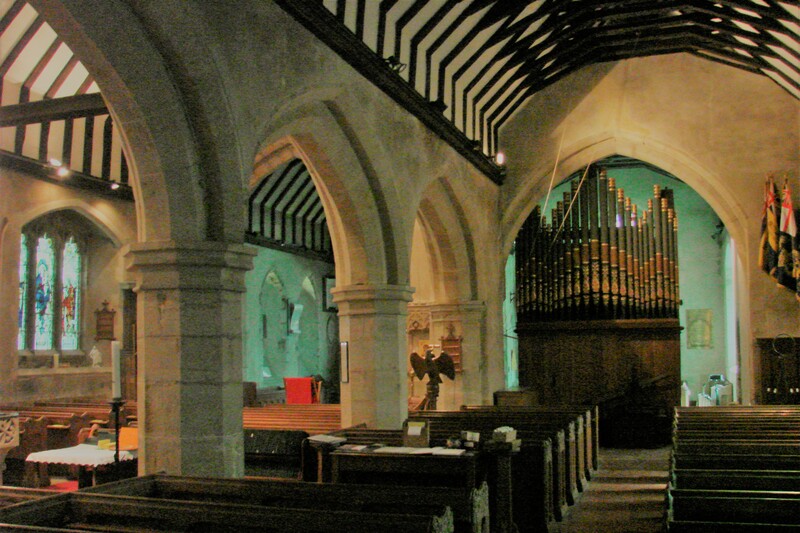 This is the approximate date of nave and chancel and there was probably nothing before. Inside the nave only the remnants of two north lancets show it is basically C13, but those in the north wall of the chancel are intact; they are splayed inside and out, with steeply sloped internal sills that are unusually low. Remnants of the south ones are visible from the south chapel, and from within the chancel are the jambs of a doorway. 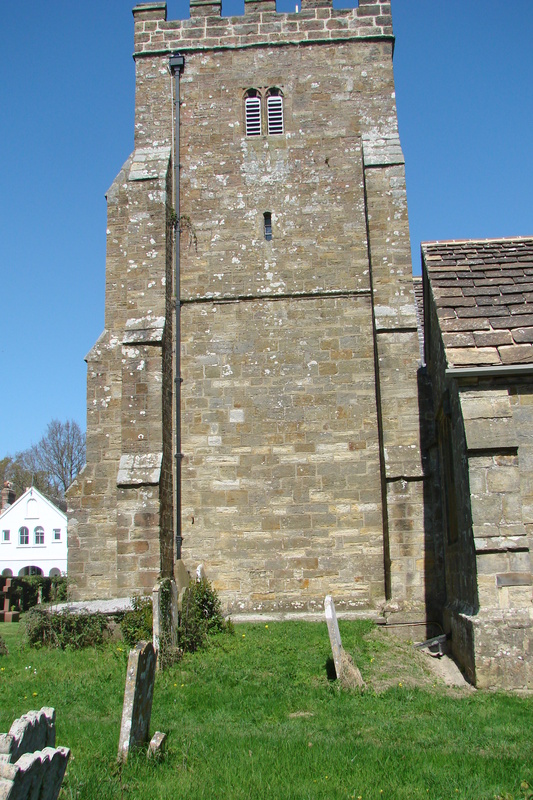 The late C15 west tower is one of a number in the area, including Rusper, Henfield and Crawley. Its angle-buttresses, three-light traceried west window and two-light bell-openings are typical and the stair-turret has a prominent octagonal top stage, battlemented like the tower itself. 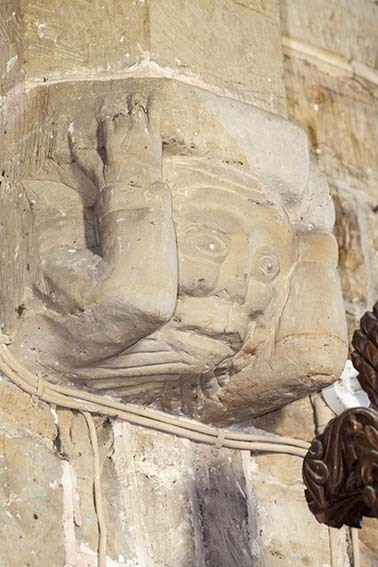 The head of the tower arch has the conceit of straining giants supporting the innermost of three orders. 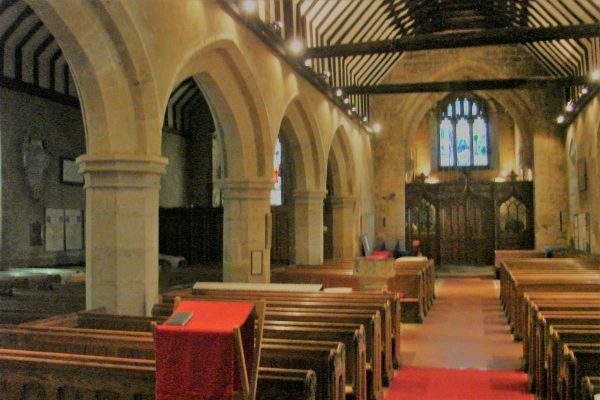 At the same time, the north wall of the nave was remodelled with large three-light square-headed windows (now largely renewed) and a single-light one. The timber north porch is probably also of this date, though the lower parts in particular show signs of extensive rebuilding. This work is mostly in ashlar, which contrasts with the C13 rubble. The detail of the gabled south aisle and chapel is very similar and shows that work continued well into the C16, for the aisle can be dated by a bequest of £6 13s 4d by Roger A Gate in 1530, which was conditional on work starting within two years (SRS 42 p43). In 1548 John Agate, clearly a relative (see below), was buried ‘in the new yle’ (ibid), so it was finished by then. The arcades have heavy four-centred, double-chamfered arches and octagonal piers. There is no clerestory so the interior of the nave is dark. Outside, the succession of gables and roofs of Horsham slabs at the eastern end creates a fine effect. The three-light east window of the chancel was altered to resemble that of the chapel and the cusped gable-openings are of this time. At a restoration in 1876-77 that cost £1800 (KD 1899), H F Price and M A E Grosholz (the name is also found as Gropholz but this is an error) of Weston-super-Mare (WSRO Ep II/27/113) renewed most detailed stonework and the north porch. 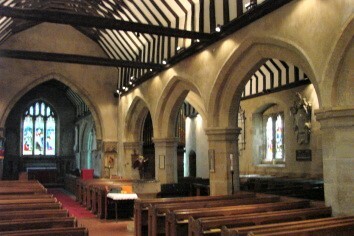 The south chapel was opened up to the nave and chancel with new arches and the chancel arch was replaced. So probably were most roofs, though an inscription in the church records further repairs in 1928. 1. (Under a locked carpet in the nave floor and only visible by prior arrangement with the vicar) Thomas Nelond, Prior of Lewes (1414-32). 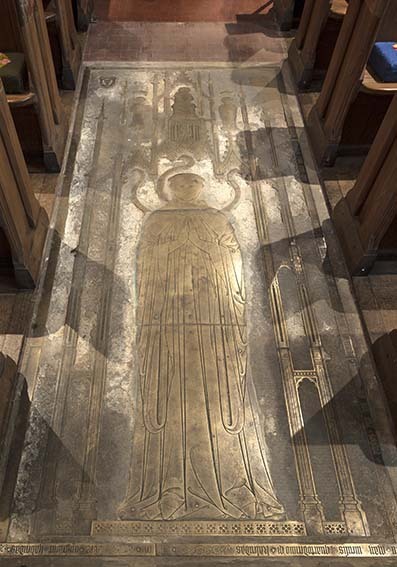 Life-size and one of the finest brasses of Series B of the London workshops in the country, this was moved here from the priory, probably at its dissolution (C Wilson: The Arts of the Great Church, in Marks and Williamson (eds) p369). The Nelond family was associated with East Grinstead and the area immediately to its south, but the reason for bringing the brass to Cowfold is not known (see 1 passim). The prior is shown in prayer, the words on long scrolls emerging from his hands, not his mouth. The magnificent canopy, with crockets and pinnacles, has the Virgin and Child at the top with St Thomas à Becket and St Pancras (the patron saint of the priory) on the sides. A narrow border contains the inscription, of which one side was already missing when recorded by Horsfield (II p261). 2. (Fixed to the third pier from the east of the nave arcade) Small brass of a civilian with a fragmentary inscription to John Agate (d1548). 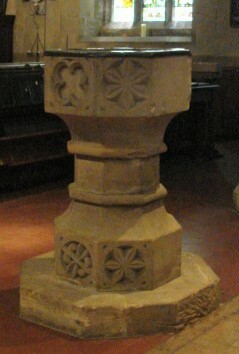 Chest: (South aisle) Early C17. Font: Octagonal with varied geometrical designs on the base and six sides of the bowl. The surviving churchwardens’ accounts contain a payment of 5s to a mason ‘for the makyng of the fonte’ in 1481/82 (2 p321). 1. 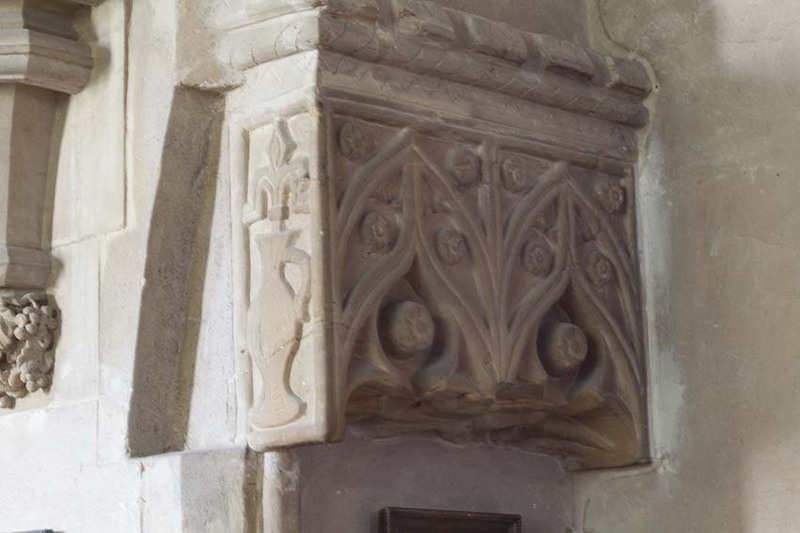 (Chancel north lancets) C15 quarries, decorated with flowers. 2. (Chancel second north lancet) Small late C14 panel of Crucifixion. 3. (East window and south aisle east window) J Hardman and Co, 1863 (www.stainedglassrecords.org retrieved on 11/2/2013). 4. 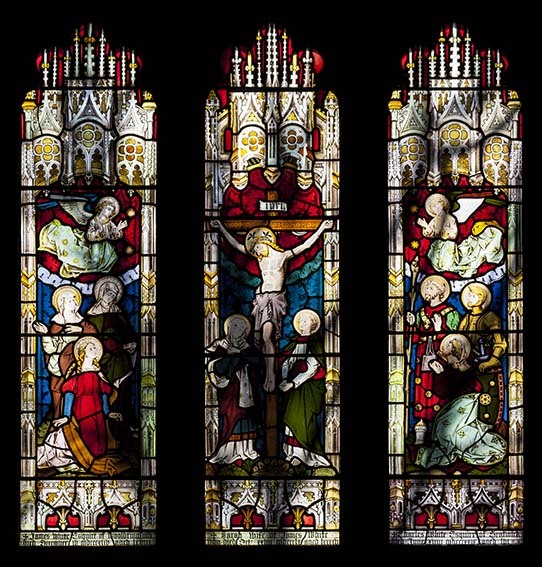 (South aisle, first window) Clayton and Bell, c1860 (ibid). 5. 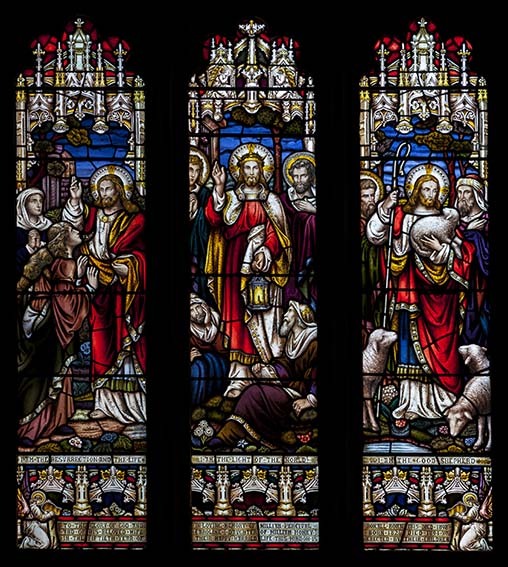 (South aisle, second window) Adoration of the Shepherds by C E Kempe, 1892. 6. 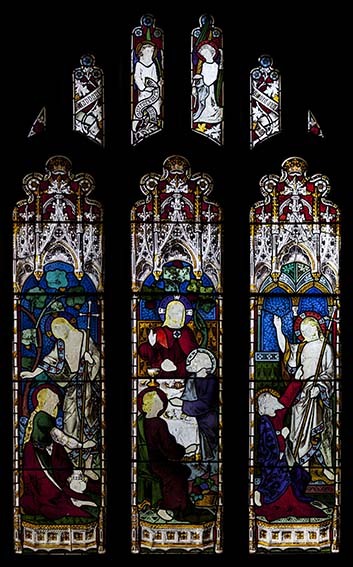 (South aisle, west window) A Gibbs, 1898 or more precisely his firm, as Gibbs was dead (ibid). 7. (North nave, first and second windows) J Powell and Sons, 1896 (designed by F Mann) and 1910 (designed by E Penwarden) (Hadley list). 8. (West window) J Powell and Sons, J H Hogan, 1927 (ibid). 9. (Nave, north west lancet) G Webb, 1934 (DSGW 1939). 1. (Above north doorway) John Pringle (d1816) Draped sarcophagus by Sir F Chantrey, executed and erected in 1831-32 (M Baker p269). 2. (East wall of south chapel) Ida Beauclerk (d1839) by L Parsons (Roscoe p952). 3. (South chancel) Rev Richard Constable (d1839) by L Parsons (ibid). 4. (North nave) Mary Pringle (d1847) by L Parsons (probably actually C Parsons) (ibid). 5. (North chancel) Ven William Brere Otter (d1876) by L Parsons (who was long dead by this date, so this is probably by C Parsons) (ibid). Niche: (South of the chancel arch) Probably C16 with an elaborate but rustic double canopy. Royal Arms: (North nave wall near west end) A painted panel bearing.the present arms, in use since 1837. The style and presentation are entirely C18 in spirit and though there is no royal cipher, these are likely to date from very soon after the accession of Queen Victoria. 2. W B Otter: Churchwardens’ Accounts of the Parish of Cowfold, SAC 2 (1849) pp316-25 (Doubtless the author was the subject of monument 5 above). My thanks to Nick Wiseman for the photographs of stained glass, the Nelond brass and the tower arch grotesque.